The settings section in the software that is password protected. Can you guys give the password for that? 1. One part of the spec says, "9) Able to mount 0402..." but another part says, "Able to mount 0201,0402..." Can the machine mount 0201s? Answer:0402 is perfect. 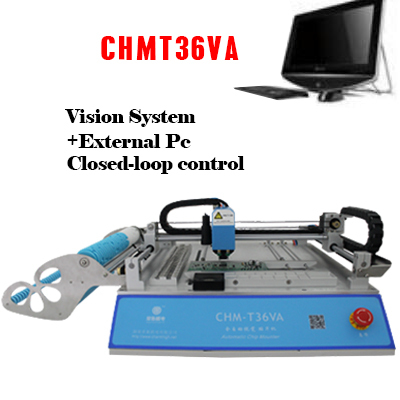 0201 you'd better try CHMT560P4 which is pneumatic feeder and more precise. Spec says, "Feeders: 29 Feeders." I have 300 part numbers on my prototype. Can we buy extra feeder assemblies? I want to load 1 feeder assembly with 29 part numbers. Have the CHMT36 pick and place those parts from that feeder assembly. Then I want to remove that feeder assembly and put on another feeder assembly with 29 different part numbers... etc. Answer:The feeding system on CHMT36, CHMT36VA, CHMT48VA or CHMT48VB are Not traditional but belt receiving system. It can Not load much more feeders.